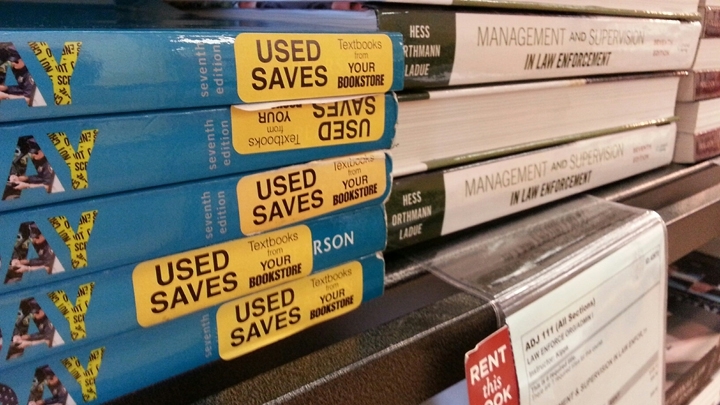 Many students buy used books or rent them, but can still spend hundreds of dollars each year. Faculty that use Open Educational Resources can eliminate this cost and improve their teaching methods. College students can spend more than $1000 each year on books and supplies. Virginia’s Community Colleges are addressing that burden by offering courses that don’t require pricey textbooks. The goal is to build entire degrees with zero textbook costs at each of the 23 colleges across the state. Catherine Komp reports for Virginia Currents. Learn More: Read about Zx23 pilot program at VCCS and the impact of Z courses at Tidewater Community College. Explore this playlist of videos on Open Educational Resources and check out one of Professor Sullivan's OER lessons for Intro to Theater. It’s the first day of class at John Tyler Community College and students are lining up in the bookstore. Cashier: Are you interested in renting any of your books? Cashiers ring up paperback manuals and thick hardcovers, checking to see if students prefer to save a few dollars by renting their books. The receipts show hefty sums. For first year student Danielle Williams, the total was $568 for three books. Danielle Williams: ...which is a lot of money, that’s like rent right there. Williams still needs two more books. She’s leaning toward buying a code to access the online versions. That can still cost $100 or more. Eli Snead: I’m in HVAC, heating and air conditioning program. Eli Snead opens his bag of new books; one’s about 1600 pages. Snead: If I had to average out the price of all of these, I spent on average about $150 per book, spent $700 total. Snead and Williams used financial aid to pay for their books, but they still had sticker shock when they saw the prices. Snead: The hard reality is, when the bills hit, some things have to get sacrificed and $700 in books - that two weeks pay for me. The cost of textbooks has risen more than 1000% since 1977, according to an NBC News analysis of federal data. That’s more than the increase in new housing, medical services and inflation. Richard Sebastian: The textbook market is pretty much broken. Dr. Richard Sebastian is Director of Teaching and Learning Technologies for Virginia’s Community Colleges. Sebastian: The textbook is really supposed to support [student] learning but we’re finding that because of the costs and because of this broken market it really inhibits them in many ways. Sometimes students put off purchasing books, says Sebastian. Some don’t buy them at all. Those that fall behind often withdraw from their courses. The students’ goals are disrupted, classes have empty seats, and schools have to refund tuition. Virginia’s Community Colleges are building a solution to this problem by offering more than 100 courses with no textbook costs. Faculty instead use open educational resources, also called OER. Content can be print, but it’s most often digital and includes text, audio, video and website links, anything that’s in the public domain and has an open, or Creative Commons license. Sebastian: These materials really give faculty more freedom and flexibly. They’re not locked into a publisher’s textbook, they’re not locked into a book that may not be very timely or maybe has some mistakes that they have to wait until the next edition to get fixed. They have complete control over what they use or don’t use with these openly licensed materials. Kerrigan Sullivan: I’m Kerrigan Sullivan, Professor of Theater and Department Chair of Visual and Performing Arts here at John Tyler. Sullivan teaches Intro to Theater, a course she designed using all open educational resources, so there's no textbook costs. Sullivan: I got into that primarily because the students that I’ve encountered over the years, textbooks can be a real burden for them. A lot of our students work full-time as well as attending school and I had over the years many, many students coming to me, having to make choices between staying in a class and not having a textbook or dropping a class. They’re making choices between buying a textbook and not having gas to get to school. These are the kinds of choices that a lot of them are faced with. Sullivan developed lessons on Ancient Greece, Asian Theater and contemporary roles like actors and technicians. Using the design app Piktochart, she assembled text, images, website links and videos. In a lesson on technicians, students get a glimpse of what happens behind-the-scenes in the production Wicked. Students access the material online or in downloadable PDFs. Key terms are highlighted and there’s study questions, quizzes and discussion. Cora Snow: It’s more than just the cost of a textbook. Cora Snow took the course over the summer. She appreciated how all the content had a purpose, unlike some courses where professors only use some chapters of the textbooks. For students with families and full-time jobs, that’s really valuable, says Snow. Cora Snow: A lot of people who have so many things on their plate, I think having it be focused and organized really makes it better for everyone. You understand what you’re getting out it and everything’s together. First year student Marcus Dabney signed up for the course this semester. On top of a full load, he’s hoping to work 40 hours a week at a grocery store. Finding out there was no textbook cost was a relief to him and his parents. Marcus Dabney: I think it’s really cool that they have the open resources because it definitely helps out the students as far as not having to pay as much for $200-something dollar textbooks and they can use that toward paying tuition or gas, or other stuff they have to deal with, bills and taxes. Virginia’s Community College System aims to have at least one zero textbook cost degree at each of its 23 colleges. The pilot program, called Zx23, is being supported by a grant from the William and Flora Hewlett Foundation. Sebastian says once a college builds a “Z” degree, it can be used and adapted throughout the system. Sebastian: Virginia is really trying to take it to the statewide level where really fulfilling the promise of open educational resources and resharing these resources and making them portable. Developing some Z courses or Z degrees at one college and making them available at another college. I think we’re leaders in that and I think that’s why we were identified by the Hewlett Foundation for this project because of where we are. Inspired by Chancellor Glenn DuBois, Tidewater Community College launched the first “Z” degree in the nation in 2013. The college found students in Z courses weren’t withdrawing and had higher rates of success. This academic year, Tidewater will have four Z degrees in Business, Social Sciences, General Studies, and Criminal Justice. For Virginia Currents, this is Catherine Komp, WCVE News.